OVERLAND PARK, Kansas – May 14, 2015 – BLACKHAWK!® and Hoppe’s® pro shooter Jessie Duff captured her second title of the young 2015 shooting season this weekend at the 2015 Single Stack National Championships in Barry, Illinois. Duff took first place in the Ladies Division by winning eight out of her 14 stages. She has now won three consecutive Ladies National Single Stack titles. The win follows up her impressive showing at the U.S. National Steel Championships earlier this spring, where she swept all three divisions. Competing and excelling in five different shooting disciplines, Duff is recognized as one of the most accomplished competition shooters in the world. 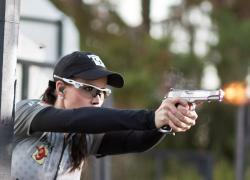 In 2013, she became the first woman ever to earn the title of Grand Master (GM), the highest ranking the United States Practical Shooting Association (USPSA) awards a shooter. BLACKHAWK! is a leading U.S. manufacturer of tactical, military, shooting sports and law enforcement equipment. BLACKHAWK! was founded by a Navy SEAL and now manufactures, holsters, tactical gear, law enforcement duty gear, hydration systems, protective gloves and gear, apparel and footwear, breaching tools and recoil-reducing stocks. BLACKHAWK! is a brand of Vista Outdoor Inc., an outdoor sports and recreation company. For more information on BLACKHAWK!, go to www.BLACKHAWK.com.